Sandton is located 20km north of the Johannesburg central business district and is now a major commercial and financial hub, with many banks and the Johannesburg Stock Exchange recently relocating their headquarters there from downtown Johannesburg. 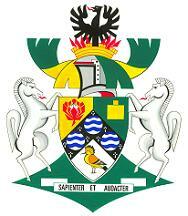 The flag of the former Sandton Town Council consisted of three vertical stripes of green, white and yellow. In the canton are the municipal arms. The arms were registered by the South African Bureau of Heraldry and granted to Sandton Town Council on 02 October 1970 and the flag adopted shortly thereafter. The Phoenix represents the rising of a new town from the former peri-urban areas and adjoining farms. The Mural Crown (masoned) is the heraldic symbol of a municipality, combined with the wreath and helmet. The shield is divided into three sections with a broad chevron. These represent the three local area committees from which the new municipality was formed. The left top third is a Protea flower which is indigenous to the area and represents the former North Johannesburg (later Sandton) Local Area Committee and Sandton's connection, through its residents, with Johannesburg and its gold mines. The bottom third is a Hoepoe Bird, also indigenous to the area, representing Bryanston and the newly incorporated areas to the north. The chevron with the three roundels barry wavy represent the three farms (Zandfontein, Driefontein and Rietfontein) which made up the greater part of the local authority area. The barry wavy being the heraldic representation for fountains. The supporters are horses indicating that the area was and is home to many interested in horse-riding and horse-ownership, as well as containing many riding schools and the Inanda Polo Club. The base is grass symbolising the rural character and green fields of the town in its infancy. The scroll contains the municipal motto, SAPIENTER ET AUDACTER which means "Wisely and Boldy". With the re-organisation of South African local government in December 1994 and again in December 2000, Sandton is no longer a separate municipality and now falls under the jurisdiction of the Greater Johannesburg Metropolitan Council. Consequently its municipal flag is no longer flown.